Which pump for which application? SYou would like to pump sandy or sludgy water from construction pits, pumping dry flooded cellars, pump well water for garden irrigation, use rain water in the househols or simply recirculate pool water? 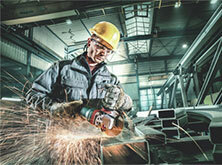 With our extensive pump technology we offer you the right system including accessories for all applications. 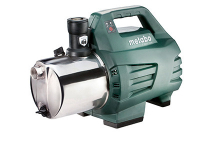 Metabo pumps are designed for safety and long service life: They are made from robust stainless steel or grey cast and have particularly high-quality mechanical seal systems. With the unique XXL warranty you are always on the safe side when it comes to service of all water and pump systems from Metabo. We provide you with proven pump technology for any application: Our site and sewage water pumps continue where others stop. Even stongly contaminated sewage water with particles of up to 50 millimetre in diameter are pumped reliably in quantities of up to 28,000 litres per hour. Our clear water submersible pumps are real helpers in need: No matter if there heavy rain flooded the cellar or a washing machine leaked - the Metabo machines reliably, quickly and automatically pump out the waste water to a residual water level of only two to three millimetres that can be wiped dry. Our combi submersible pumps are particularly versatile, since they can be used both for clear and dirty water, and in manual mode they can be used in low-intake mode down to a water level of only one millimetre. Apart from the Metabo pumps for drainage you can completely rely on Metabo's pump technology when it comes to irrigation and water supply. Our robust garden pumps, deep well pumps and submersible pressure pumps allow you to pump ground water or irrigate your garden with rain water - like this you save drinking water and protect the environment. The powerful pumps with their multi-level pump running gear pump service water from the well and up to a height of 60 metres. 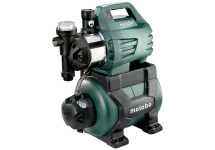 Made from high-quality materials, the pumps from Metabo are low-maintenance and particularly durable also in continuous mode. With our domestic water works you supply your WC flushing, the washing machine and other domestic appliances in an automatic and environmentally-friendly manner with free rain or well water. In their robust tank the machines always store a water supply of up to 100 litres. 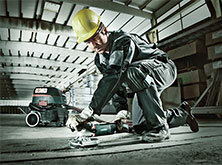 The Metabo pump protection with its dry-run protection offers maximum safety for user and machine. Filter and check valve are integrated from the start in the compact design of our complete systems. Our automatic domestic water systems are particularly intelligend and economical: The automatically pump the required water quantity as soon as a connected water tap is opened or a domestic appliance is switched on. Our robust garden pumps, deep well pumps and submersible pressure pumps allow you to pump ground water or irrigate your garden with rain water - like this you save drinking water and protect the environment. The powerful pumps with their multi-level pump running gear pump service water from the well and up to a height of 60 metres.